Cardfight!! Vanguard G: What is winning in the Bushiroad Fall 2015 Qualifiers? You are here: Home / Cardfight!! Vanguard G: What is winning in the Bushiroad Fall 2015 Qualifiers? Greetings cardfighters! Last week I reviewed some more cards from G-BT04: Soul Strike Against the Supreme. If you missed it, you can check it out HERE. This week I wanted to view the various Bushiroad qualifiers that have occurred so far and see how the metagame is shaping up. So far there have been seven qualifiers, I'll post the top 3 of each tournament in chronological order and see what's up! 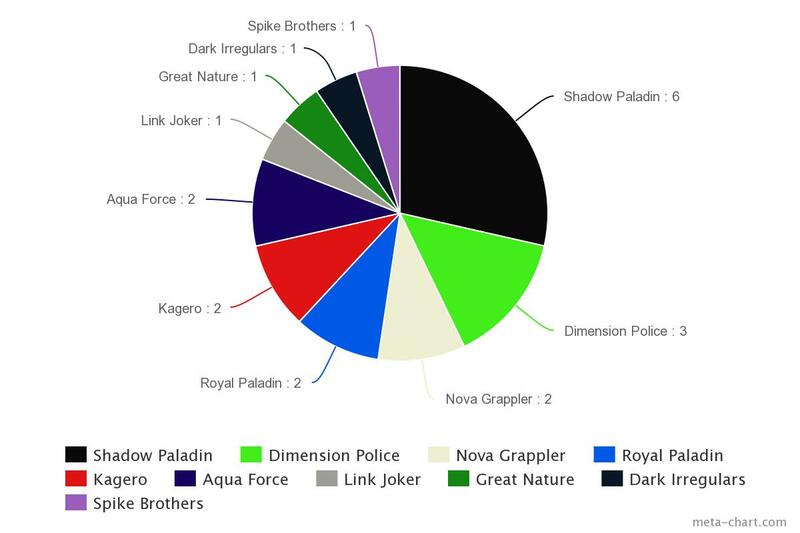 For your viewing pleasure, here is a pie chart of all the clans that have achieved a top 3 slot. Similar to how what we have seen in the summer ARG tournaments, Shadow Paladins continue to have a firm grip on the #1 slot in the metagame by a significant margin. It is no surprise either, there hasn't been a deck released that can consistently rival the sheer versatility and power that the Revenger deck has. The clan is very adept at performing various functions that other clans have to specialize in and they do it all well, along with possessing a strong early, middle, and late game. Dimension Police appears to be gaining popularity this fall and its performance shows it. During the summer, we've seen Dimension Police top here and there, but they were getting about the same numbers as most of the other tier 1.5 clans were. Commander Laurel still remains at 4 copies as opposed to the restriction the JP format received, so it isn't difficult to see why they're doing well. But the question is why are they doing better now than they were in the summer, when nothing new was released? A simple answer is perhaps the people who attend ARG tournaments are less inclined to play Dimension Police as opposed to the general populace going to Bushiroad events. While sure this could be true for some reason, however my argument is that the deck is very simple to play and has little opportunities for the pilot to misplay: there is usually a very obvious play and it isn't difficult to drop Commander Laurel and swing with Sin Buster or Heavyduke. I'm not criticizing the deck by any means, on the contrary it is to your benefit to play a simpler deck in a best of one format, especially one that is easily capable of not allowing your opponent to respond to your high powered attacks. Nova Grapplers are also a surprising sight to see. We haven't seen much of them since we left the G-BT01: Generation Stride format. Many players have written them off as a weaker version of the Aqua Force deck, which has been doing very well since their stride support came out. Now being an arguably somewhat inferior Aqua Force deck isn't a bad thing by any means, especially when the clan has Meteokaiser Victoplasma, which is something Aqua Force cannot boast. They also do not have Cat Butler, a card that is very capable of taking games due to Ultimate Raizer Mega-flare. The interesting part to me though is one of the two topping builds were pure Extreme Battlers and therefore did not use the Raizer/Cat Butler win condition. Royal Paladin, Kagero, and Aqua Force are performing at a solid rate, very akin to how they have done in the summer. Lambros, Sanctuary Guard Regalie, and "the X" have proven time and again to be strong, consistent contenders at every tournament since each of their respective cards have been released. There isn't too much to talk about here that I haven't discussed in earlier articles already. The rest of the tops we see here are from clans that have only topped sporadically or not at all this season, or in other words rogue decks. Messiah Link Jokers have the mechanics to be a powerful deck, but the terrible Revenger match-up has kept the deck from performing very well. Amon Dark Irregulars have a very powerful late game dunk with Gilles de Rais, the problem is setting up that large soul requirement while keeping some form of tempo and not losing. The infamous Spike Brothers Ogle/break ride combo finally scored a top, kudos to the player for being lucky enough to consistently get the combo off. Great Natures are a highly underrated clan that in my opinion and have the mechanics and raw sustainability to be top tier, yet scare off many players due to the specific numbers and amounts of memorization needed to play the deck to its fullest potential. Therefore, they do not score many tops due to a lack of numbers. The interesting part to me was that the winning build focused on Famous Professor Big Belly, rather than the Chatnoir/Tester Fox line-up. To finish up my thoughts, it is interesting to see that we have seen nothing from Bermuda Triangle, even though they just received their clan booster less than a month ago. They have yet to see a top and I'm curious as to why. However, there are still plenty of events to go until the Fall National tournament, along with G-BT04: Soul Strike Against the Supreme being released in a few weeks. What decks do you think will do well as we continue to go forward into the Fall 2015 World Championships? I want to know your opinions, please leave them in the comments! As always, Play Hard or Go Home!